Expression of LYPD1, PRSS23, and CDH6 declines during podocyte maturation in organoids and human kidneys. Columns demonstrating LYPD1 (left), PRSS23 (middle), and CDH6 (right) expression in A–C. (A) Feature plots of overlaid kidney organoid t-SNE plot from Figure 2C. Dashed lines outline cells in EGE cluster. (B) Overlaid podocyte (n = 645 transcriptomes) and PEC (n = 546 transcriptomes) lineage trajectories showing average expression of LYPD1, PRSS23, and CDH6; color key on far right. Gray shading, 95% CI. (C) Developing human kidney trajectories as described in ref. 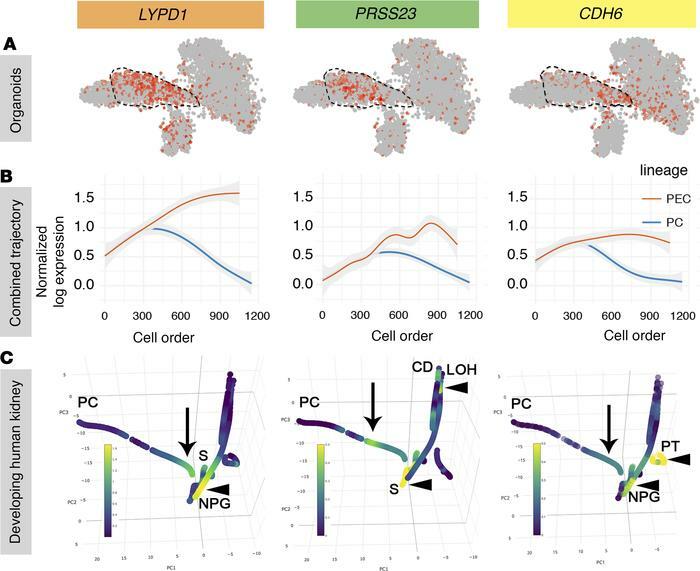 32 representing 6,414 transcriptomes with overlaid gene expression of LYPD1, PRSS23, and CDH6 oriented for optimal visualization of podocyte lineage. Arrows, maximal podocyte lineage expression; arrowheads, nonpodocyte lineage maximal expression. PC, podocyte; S, stromal; NPG, nephron progenitor; CD, collecting duct; LOH, Loop of Henle; PT, proximal tubule. Color scales represent normalized log expression.